Desmond Equipment, located in Port Shepstone, KwaZulu-Natal, is a manufacturer of specialised transport equipment. The company is driven with the ambition to succeed and the will to provide the ever changing market with the most suitable product, manufactured locally, using local resources. Desmond Equipment is jointly owned by Desmond and Louise Gutzeit, husband and wife team, with a vision for success. The company originally formed in 1973 as Desmond Transport. Initially operating in the transport business, the company grew steadily year by year venturing into the earthmoving, construction and plant hire business, as well as developing a quarry and brick manufacturing business. Again, this was a result of focused understanding of local market demand and meticulous adoption of sound business principles and initiatives. An effective operating structure enabled and justified the purchase of second hand earthmoving equipment and equip a workshop to re-furbish this equipment for re-sale. In a joint venture with BEE partners, Kwe- Africa Equipment, the proudly African product was taken to market. This progressive development allowed for the establishment of the manufacturing plant, creating effective local suppliers, employing and training staff. In 1995, with the experience gained from refurbishment the decision was made to manufacture their own equipment in close consultation with customer demands. Production began with a frontend loader in 1996 and the reaction resulted in three loaders being manufactured and sold in the first year, five units were sold in 1997. In 1998, the company saw great growth with the sales of front end loaders achieving 3% of the market. From 1998, a new product was developed every year, this is still the scenario today. The range covers: Front end loaders, haulage tractors, articulated 4×4 hauler, articulated 6×6 and6×4 dump trucks, articulated 4×4 dump trucks, motor grader, cane and timber loaders. 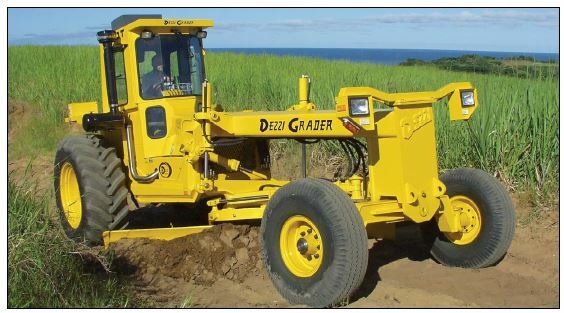 Dezzi tractors have captured a significant share of the market for dedicated haulage tractors, particularly in the cane and timber industries. The newly developed Dezzi haulage tractor took 30% of the sales in the first year of manufacture. As Desmond Equipment is a local manufacturer, with most of its manufacturing being done in house, it allows for custom built equipment. The benefit of local manufacture means 100% parts availability from the factory. Local manufacture also means that the units are built to last in our local conditions and the simplified designs eliminate costly repairs and servicing. The factory area of approximately 11000m³ is neatly laid out with office space, drawings department, stores, engineering department (with CNC machining centres), fabrication shop with profile cutters, bending, welding Co2 machines division for cab and body manufacturing, assembly shop, sand blasting and paintshop, as well as test track for testing machines. Skilled key people are in position to control these various departments. The Gutzeit family are all passionate motor sport enthusiasts and spend their leisure time racing cars and motor bikes on the purpose built 2.8km long Dezzi Raceway. 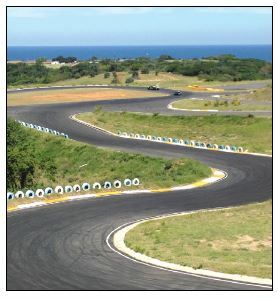 The state-of-the-art track is the only Motorsport South Africa approved track in KwaZulu-Natal and is becoming increasingly popular. Dezzi Raceway hosts a variety of motor bike racing, motor car racing and drifting events and is used as a corporate venue for testing motor vehicles as well as team building events. The Dezzi Raceway provides racing fans with all the amenities to make their day at the races unforgettable. These include two sets of open pits, one lock-up pit, an aeroplane hangar, viewing decks and banks, marshalling towers, hospitality zones, a timing office, briefing room, showers and toilets and a large entertainment area. "This track is a big milestone for us and KZN," said Des and Louise Gutzeit "It's a privilege and honour to be able to share it with the country and contribute to the growth of motorsports in South Africa. We are looking forward to huge things in the future." A company driven with ambition to succeed and the will to provide the ever changing market with the most suitable product, manufactured locally, using local resources.